Thank you for your interest in Kraken Volleyball Club. We are looking forward to an awesome 6th year of Kraken VC and getting to know our athletes and families. Please follow the below steps to properly prepare for our upcoming tryouts! Kraken VC will fill 2 Girls teams in each age group U12s to U18s, and 3rd teams will be filled in the 14s, 15s & 16s age groups. We will also offer a U11 Girls introductory team and U14 & U16 Boys teams. All teams train at The Lair Courts, a 6 court volleyball / basketball competition and training center owned and operated by Kraken VC. The Lair is just 3 blocks North of IKEA with easy access to I-5, I-405 & 167 freeways. We have some open spots in the below age groups. We are holding makeup tryouts during our regular team practices. Determine your athlete's age division eligibility by visiting the Age Group Eligibility page. Athletes are eligible to tryout / join older age group teams, but can not participate with a younger age group than their eligibility. Step 1: Complete a USA Volleyball Junior Tryout Membership registration for your athlete. 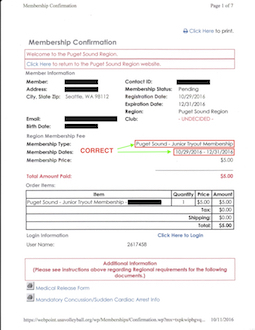 Step 2: Save copy of Membership Confirmation to your computer, recored member # and print a copy. Step 3: Verify correct doc by clicking on the sample document above and look for Green Arrows. Step 4: Bring printed copy of the USA Volleyball membership confirmation to the tryout. Step 4: Move to Section 3 below. Step 1: Click, complete & sign (parent & athlete) the USA Volleyball Medical Release and Concussion/Cardiac Arrest Forms. Step 3: Bring the completed forms to the tryout. Step 4: Move to Section 4 below. Click the Register now button below to begin the online registration. A registration must be completed for for each tryout date / age group that your athlete plans to attend, including make up dates when they are published and open for registration. Once you have paid for a tryout, there is no need to pay for additional tryout age groups or make-up dates. If you receive a waitlist notification for an additional age group or make-up tryout date, please disregard as it is a system automated notification. Please have your athlete suited up and present at the tryout time stated. Verify that you have completed all steps in Sections 1 thru 4 above. You must bring completed and signed copies of the required documents and waivers with you to the tyrout. Show up to Tryout Location up to 30 minutes before the stated start time suited up and ready to play. Selections/invitations to join Kraken VC will be extended based on athlete’s current skills assessment, potential for improvement, as well positional fit based on the pool of athletes. Extend offers in writing using the PSRVB Letter of Commitment. Incumbents now follow the same signing process as non-incumbents. Kraken VC wants athletes to play with clubs and on teams that are the best fit for them. We hope that our incumbent athletes will attend tryouts with the goal of receiving a Kraken offer. Kraken VC does not take incumbent offers lightly, incumbent athletes are given special consideration during the tryout process.